I had forgotten how into the first book in the Nine Kingdoms series I was until I got five pages into this second volume and instantly remembered. Oh, right. This story totally rocks. The first volume, Star of the Morning, ends in utter chaos. Nothing is resolved, everyone's in peril, and I remember closing the book in disbelief at the audacity of ending a book in such a way when the sequel would not be out for another year. I wasn't too upset, of course, because the book had been so dang enjoyable. I even wrote an email to Ms. Kurland asking if she had sat back and basked in evil glee after typing the last word. She responded and commiserated with me. She, too, was in utter despair after ending it that way and had to spend some good time recuperating before she could continue. That made me feel somewhat better. 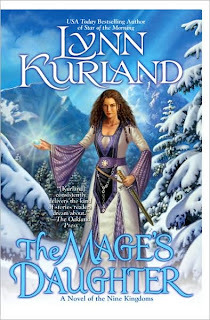 Fortunately, The Mage's Daughter picks up right where its predecessor left off. The chapters alternate between Morgan of Melksham's story as she struggles to survive after destroying the Sword of Angesand and fleeing the Archmage of Neroche, and Miach of Neroche's story as he struggles to keep the realm intact and find Morgan at the same time. Morgan and Miach are both such sympathetic characters. You desperately want them to work out their differences and accept who they are because they deserve a measure of happiness after all they've been through. That and the fact that you want them to join their awesome forces to defeat the perfidious Lothar and figure out just what kind of ubercrap is creeping out of Bain's Well. I enjoyed this book so much I unconsciously dragged it out, savoring every chapter. It's terrifically entertaining and I love Lynn Kurland's writing style. Highly recommended to anyone who loves a good adventure. But make sure you grab Star of the Morning first! Just wondering if you're going to post about the 3rd book in this series. Did I miss it?